The second race of the 2017-2018 season of Championship Formula Racing (CFR) in Detroit, the British Grand Prix, was held on Friday, October 13, at RIW Hobbies & Games in Livonia, Michigan. Nine drivers participated. When all was said and done, Garry Kaluzny won the race after starting 6th. Other podium finishers were Gary Sturgeon and Mike Cook. Garry Kaluzny now leads the points standings, 13 to 12 over Jack Beckman. 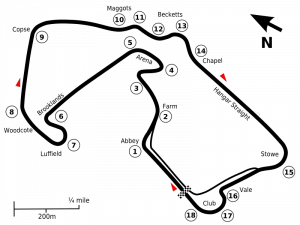 The race was on the current version of the Silverstone track, where the start/finish line had been moved from near the Woodcote corner to just past the Club corner, and with more corners added to try to slow the track some from its previous high speed configuration. 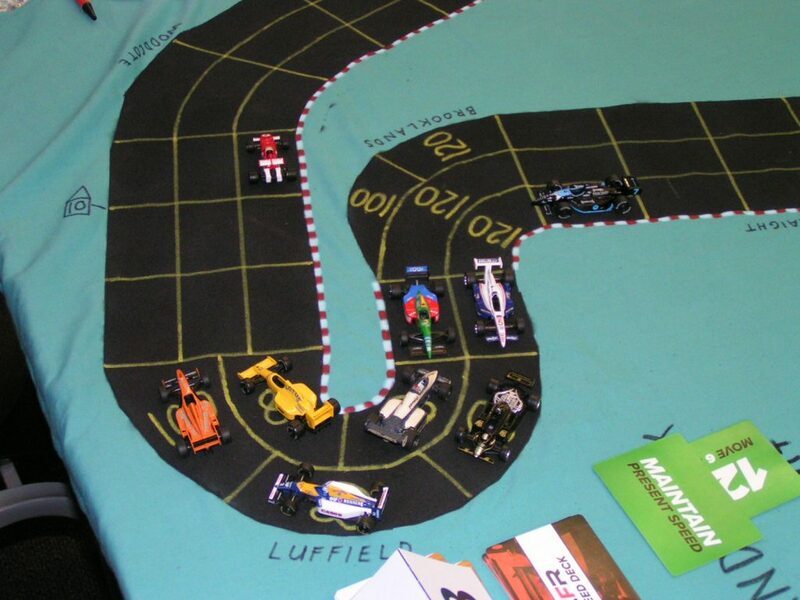 The real Silverstone track diagram. This is the version of the track used since 2011. 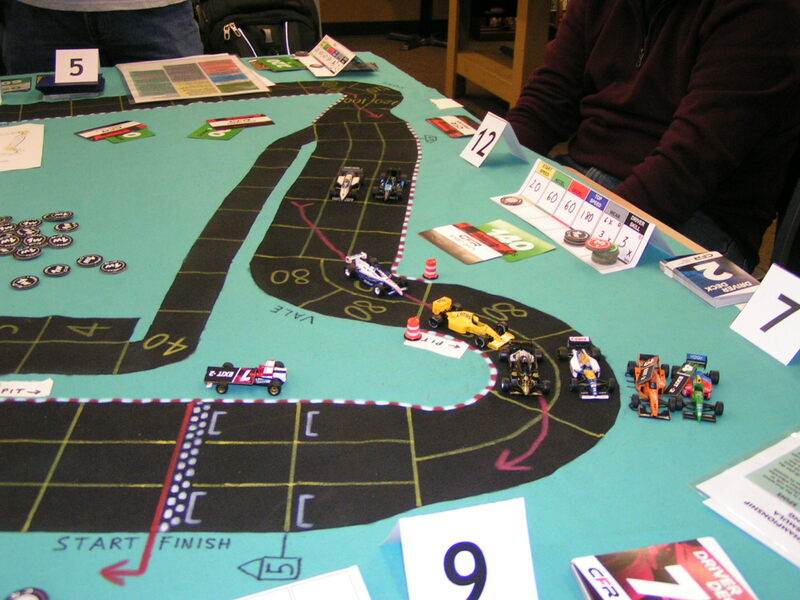 The modern Silverstone track as rendered in 1:64 scale for use with Championship Formula Racing. 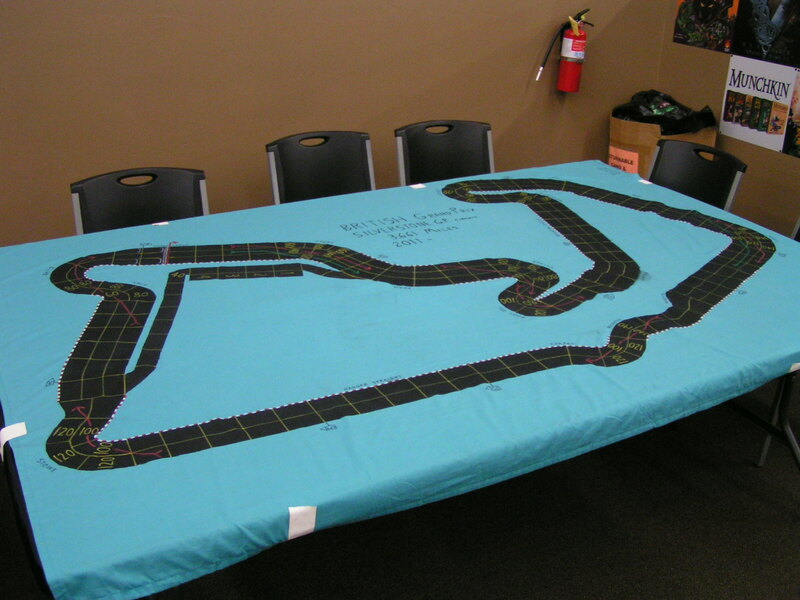 Pole position was determined by drivers secretly bidding a number of their Wear and/or Skill markers. Jack Beckman won the pole position with a high bid of 7. Gary Sturgeon started on the outside of row 1 with his bid of 3. Sturgeon bid 6 Skill markers (each of which counts as 1/2 of a Wear for pole bid purposes), which used all of his Skill markers he had available for the race. The second row had Mike Cook and Jim Robinson. 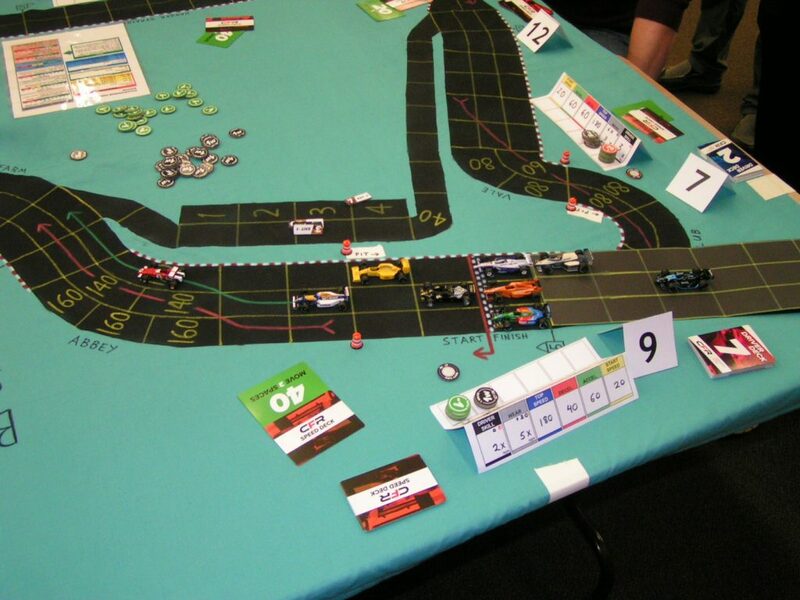 Although each of those drivers bid 2.5, Cook won the dice roll and so started on the inside. 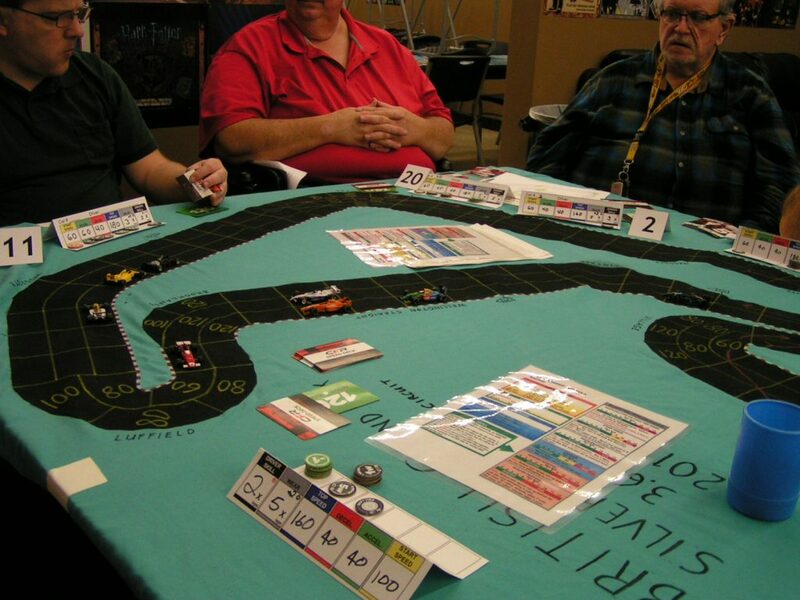 Brian Robinson, Garry Kaluzny, and Jim Landis all bid 2, with B. Robinson winning the dice roll to start 5th, then came Kaluzny in 6th and Landis in 7th. Greg Lim bid 0.5 (a single Skill marker) to start 8th, and Richard White started 9th as he did not bid anything. Once again, we were using the optional CFR rules for pit stops and tire compounds. Four drivers started on hard tires, and five started on soft tires. 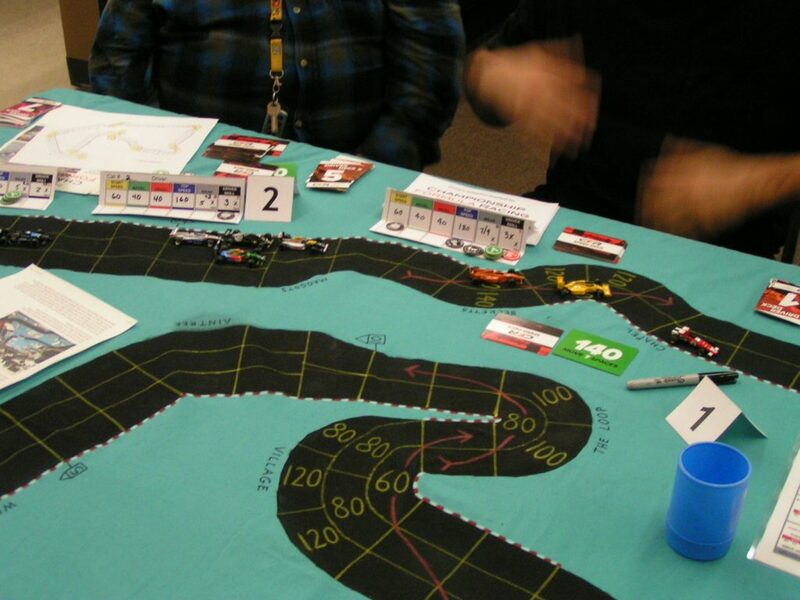 Soft tires give some driving advantages, such as being able to use a Wear to increase your start speed or your acceleration without having to roll dice, plus with soft tires you could use 3 Wear to go 60 mph over the speed limit in a corner without having to roll dice, instead of having to use only 2 Wear and roll on the Chance table if you were 60 mph in a corner while using hard tires. If a car was on hard tires, it could regain a few wear when passing the finish line each lap it did not pit for new tires. All drivers had to make at least one pit stop as they needed to use both hard and soft tires at some time during the race. At the start, pole sitter Jack Beckman jumped into the lead with his 100 mph start speed. Jim Robinson moved up to 2nd from 4th. Mike Cook kept his 3rd position, while Gary Sturgeon dropped from 2nd to 4th. Then Brian Robinson, Garry Kaluzny, and Jim Landis were all side-by-side as they crossed the start line, followed by Richard White and Greg Lim. The start at Silverstone. Jack Beckman leads from Jim Robinson, then came Mike Cook, Gary Sturgeon, Brian Robinson, Garry Kaluzny, Jim Landis, Richard White, and Greg Lim. 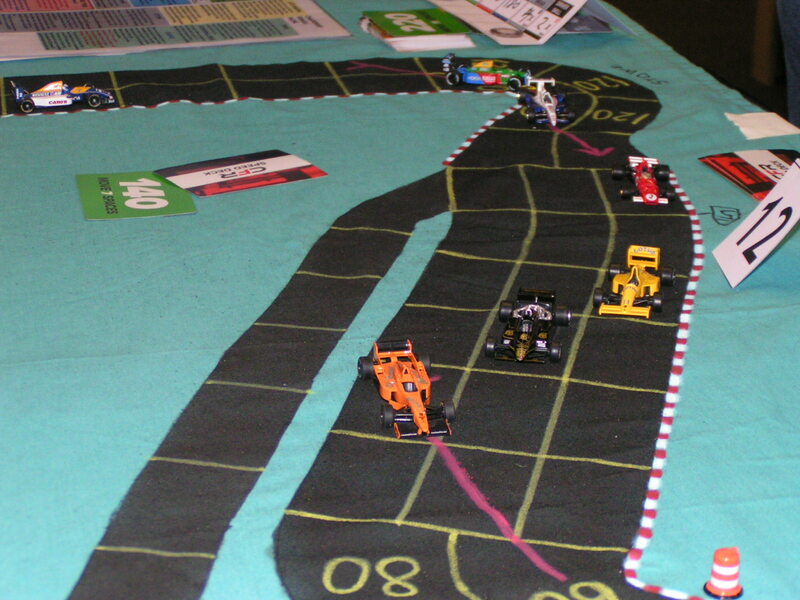 Note the temporary extension used to extend the starting grid, as the start/finish line is just past the Club corner in the 1:64 scale track. As the pack roared through the Brooklands and Luffield corners, Beckman was still in the lead, followed by Cook and Kaluzny (who had made a daring pass of J. Robinson and Sturgeon at Brooklands to pull alongside Cook). Richard White spun his Brabham in Luffield, and Jim Robinson and Sturgeon went around on the outside of that corner. Then Landis, B. Robinson, and Lim brought up the rear of the pack. Through the Luffield corner for the first time. Continuing around through the Maggots/Becketts/Chapel curves, Beckman continued leading Cook and Kaluzny by a slim margin, then a few spaces back in a bunch were J. Robinson, Sturgeon, Landis, and B. Robinson, and then Lim was a few spaces behind them. Through Maggots/Becketts/Chapel curves for the first time. Heading through the Stowe corner, Cook’s Camel Lotus was breathing down Beckman’s Ferrari’s tailpipe. Sturgeon’s John Player Lotus passed Kaluzny at Stowe, then the others followed behind. Through Stowe for the first time–Beckman, Cook, Kaluzny, Sturgeon, J. Robinson, Landis, and B. Robinson’s cars are pictured. As the cars were coming around to complete the first lap, Beckman, Kaluzny, Landis, B. Robinson, White, and Lim all pitted. Beckman and Lim switched from hard to soft tires, while Kaluzny, Landis, B. Robinson, and White switched from soft to hard tires. Sturgeon, J. Robinson, and Cook all stayed out on the track and did not pit. End of 1st lap, first pit stops. Beckman’s Ferrari (red car), Kaluzny’s McLaren (orange car) and Landis (green/red/blue car) are already in the pits. In CFR, pit stops are accomplished by simply moving your car off to the side of the track when you end a turn within the pit stop zone. 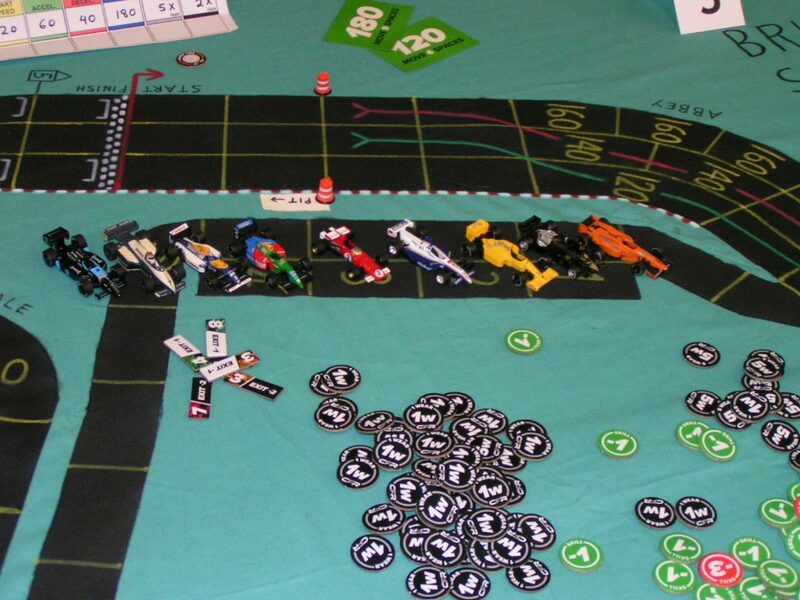 In the above picture, you can see pieces of tape with “Pit” and an arrow on them to indicate the “pit stop zone” (also a pair of orange barrels mark the beginning of the pit stop zone). Then cars are marked with an “Exit -2” marker the turn they enter the pits. 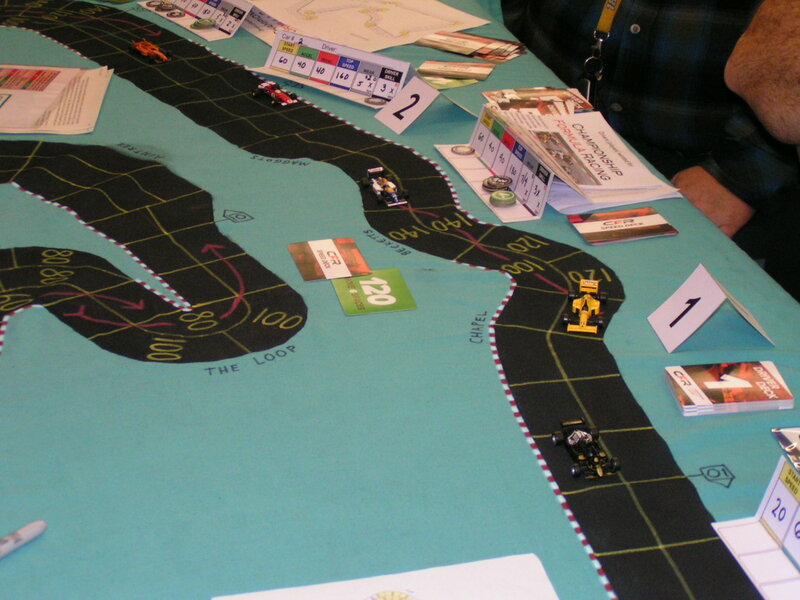 The following turn (while the car continues to sit in the pits), the Exit -2 marker is flipped to its “Exit -1” side, and then the next turn after that, the car can re-enter the track and resume its former speed. The official order at the end of Lap 1, and before the pit stops were resolved, was Beckman, Sturgeon, J. Robinson, Cook, B. Robinson, Landis, Kaluzny, White, and Lim. However, after the stops were resolved, the actual running order on the track was Sturgeon, J. Robinson, Cook (none of whom had pitted), Beckman, Landis, Kaluzny, B. Robinson, White, and Lim. During the 2nd lap, the cars that did not pit enjoyed a bit of a lead over the rest of the pack, and the field became spread out somewhat. Through the Luffield corner the second time around, Sturgeon, Cook and J. Robinson led by 5 spaces over Beckman, then Kaluzny and B. Robinson were another 3 spaces behind Beckman. Landis was 2 spaces behind Kaluzny and B. Robinson, then Lim was 6 spaces behind Landis, and White had fallen farther behind, after spinning at Village corner (his 2nd spinout of the race). Through Luffield corner on the 2nd lap. 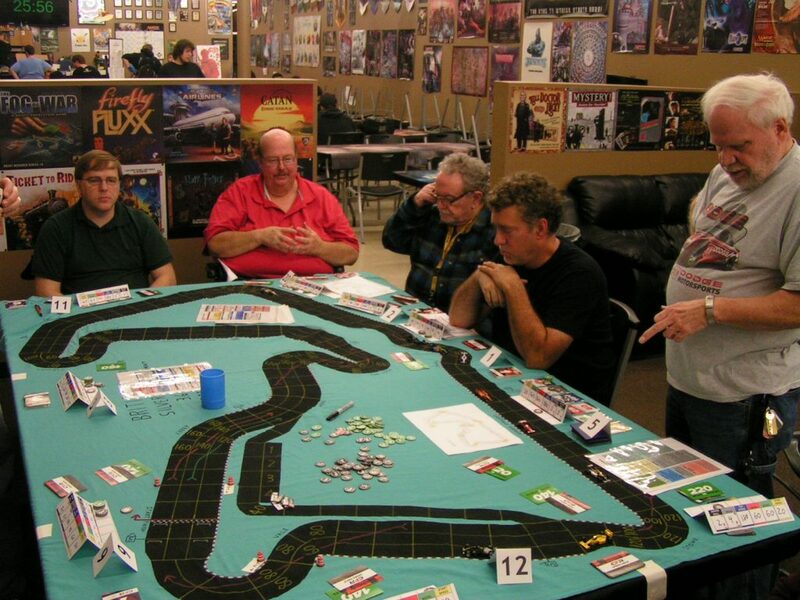 Actual drivers pictured (left-to-right) are Mike Cook, Jim Landis, and Jim Robinson. Going through the Maggots/Becketts/Chapel corners on the 2nd lap, the field was even more spread out. Sturgeon led from Cook, then came J. Robinson, Beckman, Kaluzny, B. Robinson, Landis, Lim, and White. Through Maggots/Becketts/Chapel on the 2nd lap. Sturgeon managed to hold his 3-space lead over Cook through the Stowe corner, and the rest of the field remained strung out in the same order behind him. Through Stowe corner for the 2nd time. Gary Sturgeon’s John Player Lotus (the black car near the large “12” marker) leads the pack. Drivers pictured (l-to-r): Mike Cook, Jim Landis, Jim Robinson, Richard White, and Brian Robinson. As the leaders came up to the start/finish line to complete the 2nd lap, the three leaders, Sturgeon, Cook, and J. Robinson, all had to pit to change tires. Sturgeon and Cook changed from hard to soft tires, while J. Robinson changed from soft to hard tires. All of the other drivers stayed out on the track this time around except for Lim, who pitted to put a new set of soft tires on his car to replace the worn out soft tires. Completing the 2nd lap. Gary Sturgeon (black car) and Mike Cook (yellow car) have already pulled into the pits. It should be noted in the above picture of cars in the pits, that there is a “pit road” (with the 40 mph speed limit) in the infield of the track. 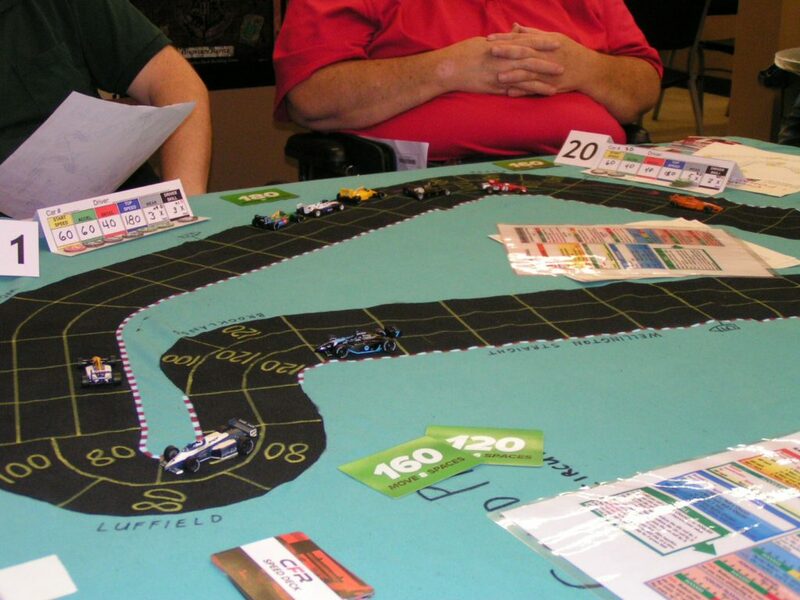 While we are not using that pit road with the CFR simplified pit stop rules, it was painted onto the track just in case we ever revert to our old “Advanced Speed Circuit” pit stop rules. The official order after the 2nd lap was completed by all cars was: Gary Sturgeon; Jim Robinson; Garry Kaluzny; Jack Beckman; Brian Robinson; Mike Cook; Jim Landis; Richard White; and Greg Lim. By the time the lead cars were in the Luffield corner, the order was Kaluzny, Beckman, Sturgeon, Cook, B. Robinson, Landis, J. Robinson, White, and Lim. Lim was quite a ways behind White after making a 2nd pit stop. Kaluzny takes the lead at Luffield on the last lap. 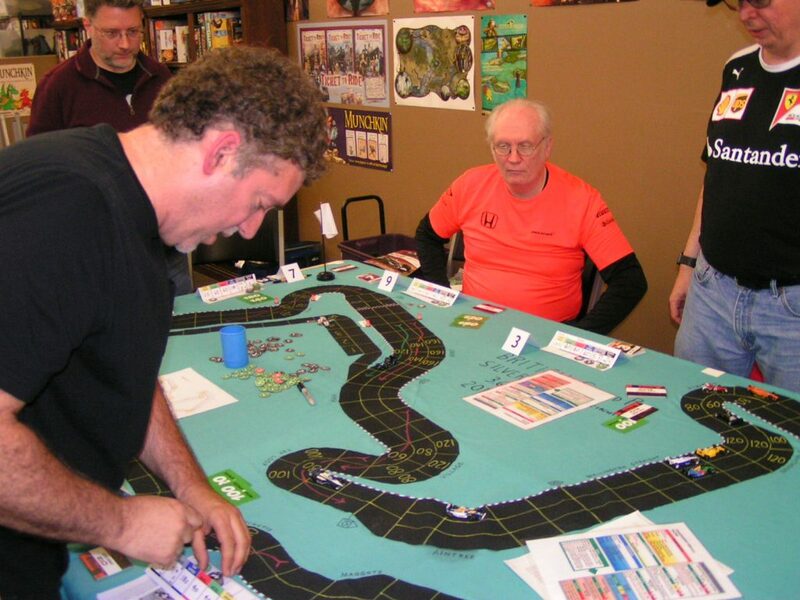 Pictured (l-to-r): Richard White (foreground); Gary Sturgeon (background); Garry Kaluzny (orange shirt); Jack Beckman (black shirt). Kaluzny had taken the lead from Beckman going through the Brooklands/Luffield corners, as Beckman’s Ferrari was about out of Wear. Kaluzny stayed on the track after lap 2, and had 8 Wear remaining, then added another 2 Wear due to his being on hard tires, so he had 10 Wear left to use on the final lap. When Sturgeon and Cook came out of the pits after lap 2, they had 12 and 9 Wears, respectively, after replenishing their Wear. Going through Copse corner the last time, Kaluzny’s McLaren led from Beckman’s Ferrari by 3 spaces, and then Sturgeon, Cook, Brian Robinson, and Jim Landis were all nose-to-tail right behind Beckman. Kaluzny leads through Copse corner on the last lap. Kaluzny held his lead through the Maggots/Becketts/Chapel set of curves, but when he got to the Stowe corner, the rest of the pack had suddenly caught up to him. As they all approached the Vale and Club corners the last time, Kaluzny, Sturgeon, and Cook were running 1-2-3, all in follow-the-leader order. Approaching the Vale corner for the last time. As they went through Vale and Club corners, Kaluzny moved at 120 mph, burning 2 Wear, but Sturgeon, in 2nd place, went 140 mph while using 3 Wear due to being on soft tires, and that allowed Sturgeon to pull alongside Kaluzny as each driver was only one space from the finish line. But Kaluzny had 1 Wear and 2 Skill chips left, while Sturgeon had no Wear or Skill chips remaining, so on their next turn, Kaluzny plotted to move at 200 mph, and Sturgeon only plotted 160 mph. 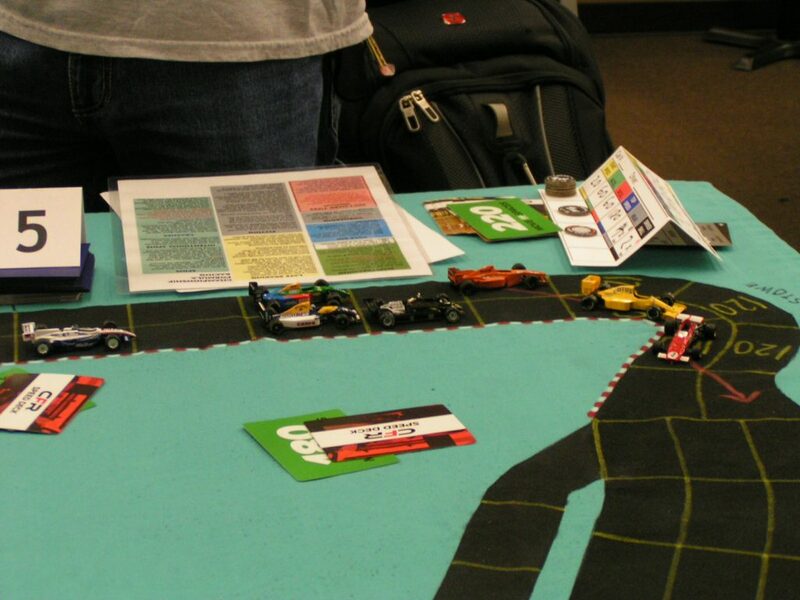 So Kaluzny’s car moved first, and he had to make both of acceleration and top speed dice rolls, using a -1 Skill marker for each roll. Then, after moving a space, Kaluzny made an unmodified deceleration dice roll to reduce his speed to 180 mph, and he was then able to go through the corner past the finish line at only 20 mph over the speed limit, for which he used his final Wear (that had been hoarded for such a use). It should be noted that the CFR rules say that if a car crashes in the corner past the finish line, that it is considered to have NOT finished the race at all! 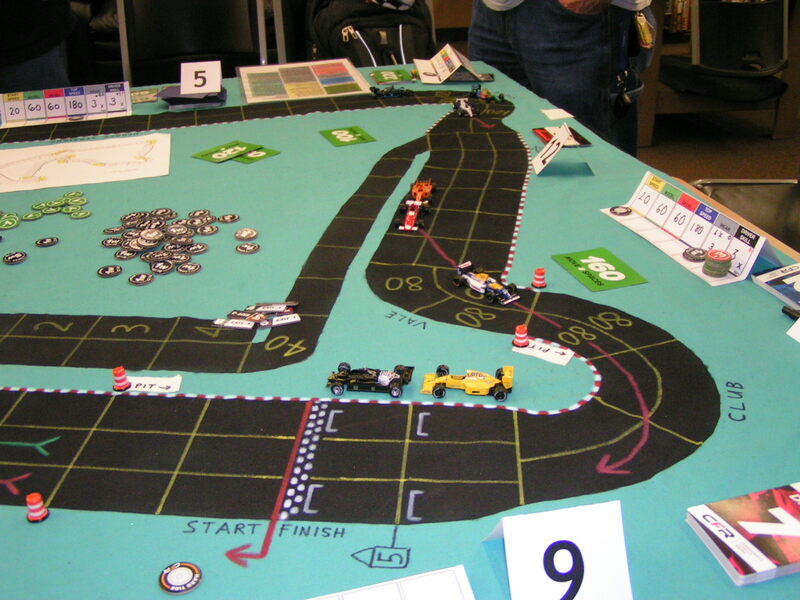 Also, if a car spins in that corner after the finish line, the spun car is considered to have crossed the finish line behind all other cars that also crossed the finish line that turn. So, after Kaluzny (+5) took the checkered flag, followed very closely by Sturgeon (0), the rest of the field finished in this order: Cook (0); B. Robinson (+1), Beckman (-4), Landis (+1), J. Robinson (-3), White (+1), and Lim (-1). The + or – numbers indicate how many positions that driver gained (+) or lost (-) from where their car qualified for the race. 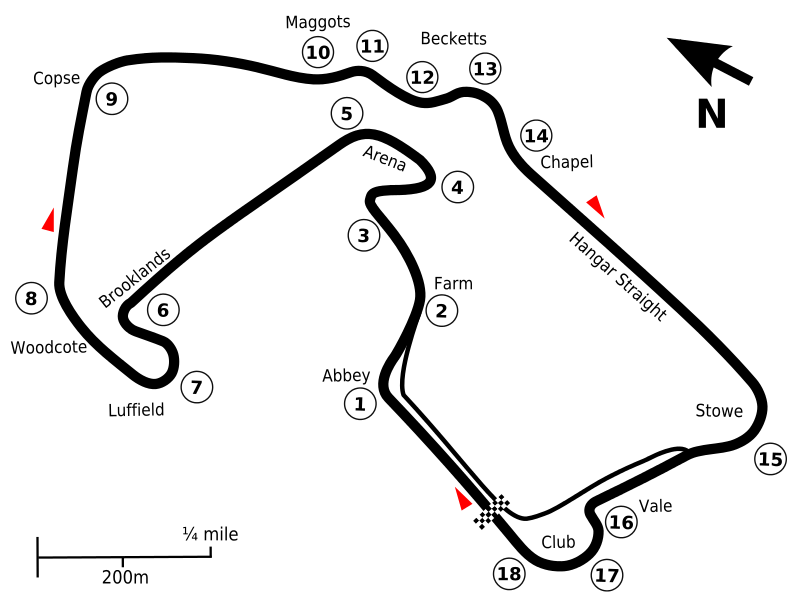 The points awarded at this race: Kaluzny 10; Sturgeon 6; Cook 4; B. Robinson 3; Beckman 2; and Landis 1. This was the 2nd race in a row where all of the starters also finished the race. Quelle surprise! This has set a new record for the most consecutive races in the Detroit area Speed Circuit/CFR races for all starters finishing the race. The next race will be the Monaco Grand Prix. We will race that on Friday, November 10, 2017, at Imperium Games in Wixom, Michigan. Race time is 7:00 pm, although we would like drivers to try to get there (through bad rush hour traffic on I-96!) by 6:30 pm so they can get their car set up. Most drivers were early at the British Grand Prix race, and that allowed us to start just about on time. This entry was posted on Saturday, October 14th, 2017 at 5:22 pm	and is filed under Board Games, Miniatures Games. You can follow any responses to this entry through the RSS 2.0 feed. Both comments and pings are currently closed. Keep the reports coming. I’ve gone back and read some of the older ones. I especially loved the series on building the tracks. Ingenious!! Thanks.